"Masala Dosa" a famous South Indian cuisine , which is one of my all time favorite. Though the process of preparation of Masala dosa is too long, its too worth also. I always prefer experiments in this lovely dish. 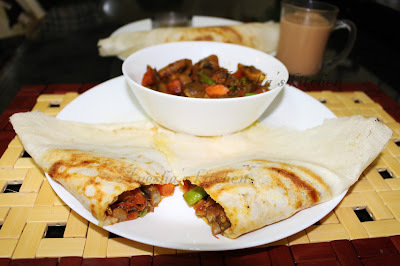 Here is an incredibly delicious and simple masala dosa recipe , stuffed with mushroom and yet another vegetables too. Marinate mushroom pieces with turmeric powder and salt. Then cook till half done. Keep the mushroom and its water aside in a separate bowl. In a non stick pan heat some oil and add sliced tomatoes. Then add turmeric powder, Kashmiri chilly powder, salt and mix well. Cook till all the ingredients get well mixed.You can add 2 tbsp of the mushroom stock ( the water kept aside) if needed. When the gravy becomes thick add french beans and carrot . Again cook for few minutes and now add the half done mushroom . Cook till the mushroom get mixed well with the gravy. Finally heat oil in a pan and saute the sliced onion till golden . Mix it with the cooked mushroom gravy. Soak the dal and rice for 4 hours in separate bowls. Then grind them together well along with rice flakes (soak in water for 15 minutes) and cooked rice. Pour to a big bowl and mix well . Put salt and keep overnight( at least 8 hours, preferably 10 hours). Heat the pan on high flame. When hot reduce the flame to medium low . Spread some butter / ghee and pour a ladle full of batter . Spread the batter in circular motion with the back of the ladle itself and make thin big dosas . 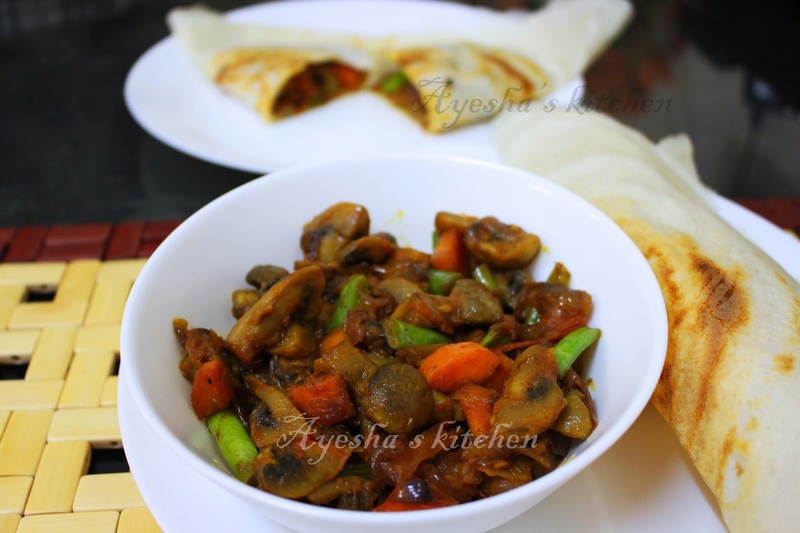 Cook till the dosa turns golden brown and then put the mushroom masala as the filling.